This is how we make tamalitos at my house in Belize! It's a long process, usually about 6 hours, but here's a 5 minute fast glance. 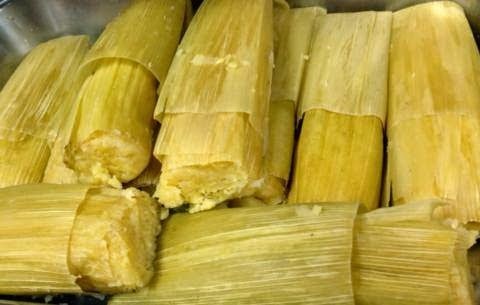 Ducunu is a sweet tamales type dish that's made with corn. This dish is rich because it's made with coconut milk. This side dish can be eaten with Stewed Chicken or Stewed beef or it can be eaten alone. Ducunu is usually made plain or it can be stuffed some type of meat or with spinach as I've done in this video. In this video I do a retake of the Ducunu recipe that's already at the site. This recipe is a little more moist than the original, but still great taste. Spicy, yet a little bit sweet. It goes well with stewed chicken, stewed beef or stewed pork. Peel off husk and silk. Leave the large husk to wrap ducunu. Melt margarine (low heat). Add melted margarine, salt and baking powder to corn. Put two or three corn cobs in pot to balance ducunu. Add water. Bring to a boil. Put one large tblsp corn mixture in each corn husk. Fold over and set between cobs in boiling water. Boil for 20-30 minutes. Out here in Los Angeles we can't do it like we do them in Belize because the corn is different . I tried it and it didn't come out right . We used corn that comes in the can and we have to add corn meal to make it thick so you can wrap them and we put it in foil paper or you can go to a Mexican Store in your area and purchase corn husks in a package! OR you could use husks from corn sold in the USA and boil those corn to be eaten with Mexican Style Crema or with a little butter spread on it - adding salt. and red pepper and a squeeze of lime or lemon and save the corn husk for the tamalitos! That is also an option!